Whether you're by the ocean or in the cold north, the POLYWOOD® Nautical 48" Porch Bench has the strength and durability to withstand any type of weather. The unique design of this polywood porch bench is sure to stand out on your patio and be one of the centerpieces of your outdoor decor. With 48" in width, plenty of space is provided for two people to relax and take in the beauty of the outdoors. The headboard on the Polywood Nautical 48" Porch Bench provides proper back support while also giving the polywood bench a classy look. Build your own polywood set for your patio by adding the matching Polywood Nautical Highback Chair and Polywood Club Coffee Table to complete your patio decor. 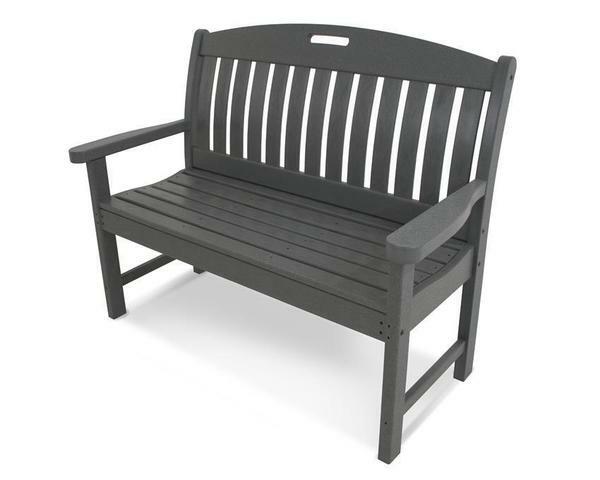 Made of recycled poly lumber, this piece is environmentally friendly and remarkably durable. It is a great addition to any patio or deck and will last a lifetime. If you have questions about the Polywood Nautical 48" Porch Bench, one of our other products, or wish to place an order over the phone, do not hesitate to call and speak with one of our friendly Amish Furniture Specialists toll-free at: 1 (866) 272-6773. Boxed Dimensions - 47" x 24" x 11"
Boxed Weight - 67 lbs.